Simple and small portion bento for the kids this morning. Two little boys were made of 2 layers potato with crab stick in the middle. The hair was made of skin of fried fish cake and nori for they eyes. I've got different type of purple potatoes this time. Usually when I steamed them, I got the deep purple color. For this one, no matter how long I steamed them, I got the light purple color. Today I was experimenting to put a little bit of turmeric water and salt when mixed the egg, so I can get that nice yellow color for the the egg roll. Inside the box : rice, pork fillet (marinated with salt and ginger), egg rolls, mushroom + preserved daikon stir fry, sweet purple potatoes, strawberry, green tomato, and carrot as a baran. You did get that egg very yellow! I love that bright color! The lacy carrot is so pretty too, and the purple gives a nice dark edging. Good idea for the brown hair too! The yellow colour of the egg roll turns out very nice! Love them! By the way, by steaming the potatoes, will them get oxidize and turn black colour? I always has this problem with yellow potatoes. What are the cute little pufy-flower things in the background? They're adorable! I like how you created a baran/fence with the carrot. Very creative! I wish I could find fresh purple potato, I only found a frozen bag and they never look as purple as yours do! I love the carrot divider and the way you cut the green tomato! 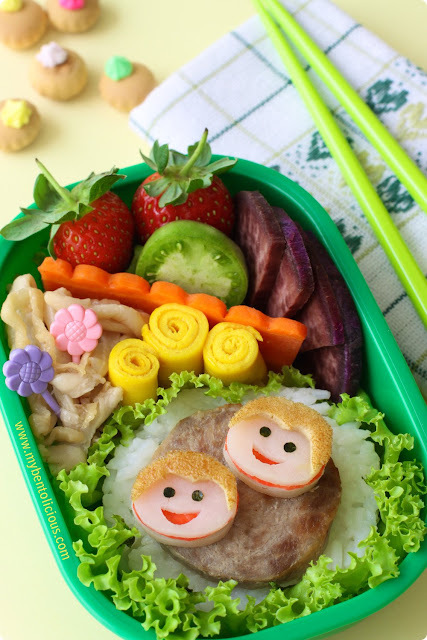 Another very nice bento Lia! The yellow is bright and look really cheerful in the box! I might try doing it one day! @Kids Dream Work : Thanks a lot for your kind comment! I didn't see the steamed potatoes turn black after they steamed. What I did >> as soon as I peeled them, I soaked the potatoes in cold water with a little bit of salt or lemon juice for few minutes. And yes, like banana they can easily bruised. I prepared this bento at 6.30am and kids eat it around 9.30am so it was ok.
@hapabento : Thanks a lot Debra! Those little puffy things are what we called color gem biscuits, topped with color sugar. My mom used to make it since I was a kid but now it's pretty easy to get it in supermarket or cookies store. Can be found in Malaysia and Singapore too. I don't know about the other Asian countries. The two boys are so darling. The bento looks so tasty. @allingoodfood42 : Thanks a lot Marisa! sweet idea using carrot as baran! And the hyper yellow egg looks brill! i love the idea of the fish cake for the hair, it came out so cute! i also agree with debra, the carrot "fence" is adorable. and that green tomato looks so tart and yummy! perfect! I love the bright yellow of the egg. Mixing it turmeric really did make it shiny. The green tomato looks funky. I haven't seen any of those around (will have to keep looking). How cute hairs they have! Want to make my hairstyle like them haha! The color's balance of all is PERFECT! @Rachel Hei : Thanks a lot Rachel! @tatabonita : Thanks a lot Tata! When your kids see the smiley little boys, they will sure smile back. What a lovely way to put a smile on your kids faces. The layered fruits and veggies are BEAUTIFUL in this bento! Stunning colors, and so healthy! I love this one, the colors and protions are perfect!